Elizabeth Coffman, James Martin and Mark Bosco spoke to a packed house at the McNally Amphitheatre. Few folks in this country can lay claim to being a woman, a Southerner, a devout Catholic, and an acclaimed writer. Flannery O’Connor, who wrote the novels Wise Blood (Harcourt, Brace and Company, 1952) and The Violent Bear It Away (Farrar, Straus and Giroux, 1960), as well as 31 short stories, was that person. All her strengths and idiosyncrasies were on full display in a preview screening of the forthcoming documentary Flannery on Thursday at the Lincoln Center campus. The documentary, which tells the story of O’Connor through the eyes of contemporary writers and artists such as Tommy Lee Jones, Alice Walker, and Alice McDermott, is a mix of interviews, animation, and never-before-shown archival footage of O’Connor, whose life was cut short by illness in 1964, when she was 39. 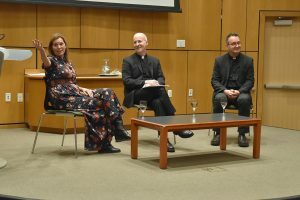 The screening was followed by a discussion with the filmmakers, Mark Bosco, S.J., vice president for mission and ministry at Georgetown University, and Elizabeth Coffman, Ph.D. associate professor of communication at Loyola University of Chicago. 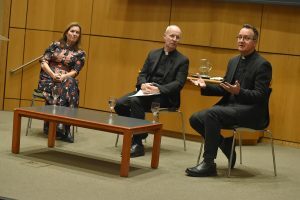 The discussion was moderated by James Martin, S.J., editor at large of America Magazine, which co-sponsored the event, and attended by members of O’Connor’s family, including her cousin Francis Florencourt, Catherine and Randy Man, and Robert and Susan Mann. Curran Center associate director Angela Alaimo O’Donnell said before the screening that the Flannery O’Connor Trust has bequeathed a grant of $450,000 to the center. Angela Alaimo O’Donnell, Ph.D., associate director of the Curran Center for American Catholic Studies, the primary sponsor of the event, said that although O’Connor was forced to spend a great deal of time at her family’s farm in rural Georgia after she was diagnosed with lupus, her rich internal life provided more than enough grist for the film. 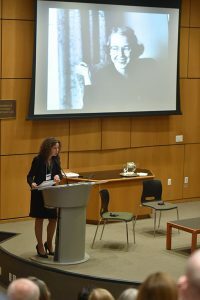 O’Donnell, an O’Connor scholar who appears in the film, told the audience that the Flannery O’Connor Trust has bequeathed a grant of $450,000 to the Curran Center for use in programming related to the renowned author. “Flannery O’Connor was doubtful her story would be worth writing a book about. She would likely be astonished to learn that not only was her life interesting enough to be the subject of multiple biographies, but was also exciting enough to make a movie about,” she said. In their discussion, the filmmakers touched on topics as varied as the logistical challenges of making a film about a writer who appears in few pictures and even fewer films, the darkness of her writing, and her complicated relationship to the civil rights movement. “From the outside, O’Connor just looks difficult and hard, but once you get the key, it opens the door to all her stories, and you can just go deeper, said Father Bosco, right. Father Bosco said O’Connor’s reputation for a bleak outlook is easier to understand when one takes a fuller look at her life. Despite the fact that her father died of lupus when she was 15, when she herself began showing symptoms while living just outside New York City, her diagnosis was hidden from her for several years. Stints at the University of Iowa’s prestigious writing workshop and the Yaddo artist community in Saratoga Springs illustrated her enormous potential to be a larger part of the literary community at the time, but the disease forced her to retreat to her family’s farm in Milledgeville, Georgia. “From the outside, she just looks difficult and hard, but once you get the key, it opens the door to all her stories, and you can just go deeper and deeper and deeper into them. And I think that that’s what we were trying to do with telling her life,” said Father Bosco, whose scholarship focuses much of his work on the intersection of theology and art in the British and American Catholic literary tradition. 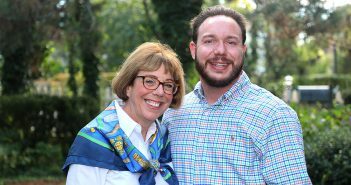 Coffman, a film scholar and active documentary filmmaker, said it was also important to remember that she was diagnosed when she was 25, but lived another 14 years. “Seeing how much work she created between then—you know, she really wrote with a death sentence over her head. She was so stoic about her illness, and rarely spoke about it, but she lived with it, and you see it coming out in her fiction,” she said. “It’s not about covering up anything, nor is it ignoring what she was born into and the culture she lived in. I know that culture. 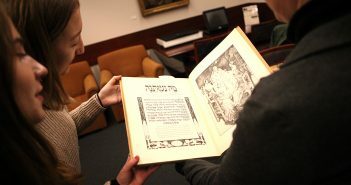 I grew up in it too,” said Elizabeth Coffman, left. O’Connor also chose not to meet James Baldwin when he came to Georgia, because she feared it would create a scandal and alter her public identity, and thus make it more difficult for her to observe and write about Southern culture. “It’s not about covering up anything, nor is it ignoring what she was born into and the culture she lived in. I know that culture. I grew up in it too,” Coffman said. Bosco agreed, noting that O’Connor saw civil rights as a slow evolution and was very put off by Northerners coming down and telling Southerners how to solve their social problems. “We have feminists who both love and hate Flannery O’Connor. You have people in race theory who love Flannery O’Connor and hate Flannery O’Connor, and write about her,” he said.